Are Echinodea the ultimate animal? Does the structure of sand dollars and sea urchins give clues to their survival, growth, behavior and reproduction? Students will work in partner and table groups to share and build on ideas. Students will present information to class. Students will work in math class to explore the idea of the Golden Rule. Students will write letters/emails to local and state representatives. Students will display scientific drawings in public space at school. Students will letters and make oral presentations in their ELA classrooms. Engineering: comparing 3D models of sand dollar and urchin tests, scientific drawing, analyzing models for information and using them to inspire further questions. Making diagrams and comparing to see structure of organisms. Technology: researching online, Study Jams, Quizlets, emailing US senators and local representatives to encourage maintaining legal protection of our marine environments and continued support of climate change initiatives. Are Echinodea the ultimate animal? Have students write about how they changed over time to become one of the ultimate marine animals. Sand Dollar and sea urchin test observations and scientific drawing . Where this curiosity began: show pictures of fossil sand dollar from the Gatun Formation in Panama. 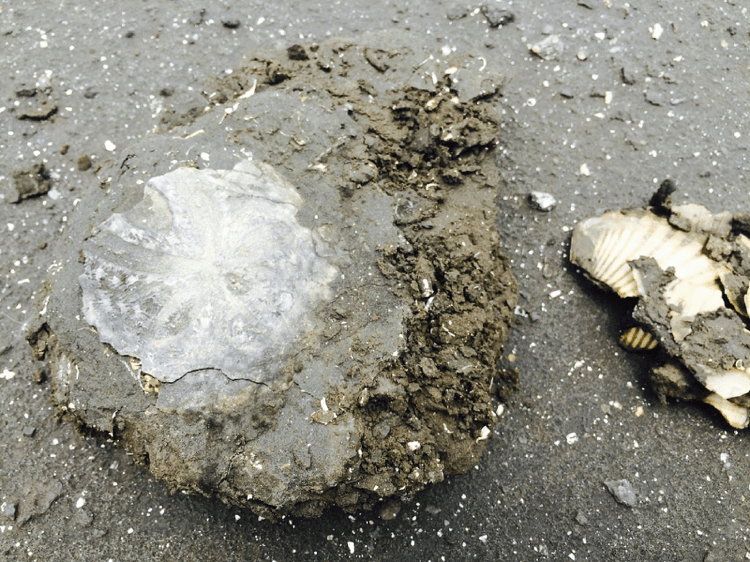 Download a PowerPoint with an image gallery of Fossil sand dollars, sea urchins, and sea biscuits. Courtesy of the Florida Museum of Natural History, Invertebrate Paleontology Image Gallery. 3D Print a sand dollar test and sea urchin test. Provide students with rulers and calculators to assist in measurements of sand dollars. Students should begin their drawings of the front and back side of sand dollar on the opposite side of the paper- continuing to write observations as they go. When drawings are complete have students discuss their observations with table group. Teacher can also write observations and questions on overhead so students can gather information from whole class ideas. Hand students the graphic organizer. Write learning goal on top of agenda- to be used for the rest of the unit. The learning goal should be crafted from student questions from day one. Our learning goal : What does the structure of an organism tell you about how it survived, grew, behaved and reproduced? Let students know that you crafted the Learning Goal from their questions. What information do these models provide? What information about the structure of these organisms do you still need? Is one model better than another? Have students view video again, pausing when necessary to answer the rest of the questions on worksheet. 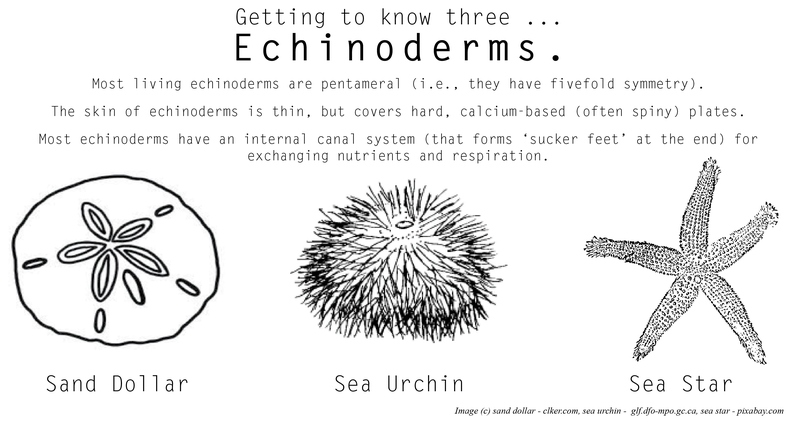 Print “Evolution of Echinoderms” worksheet on page 1, from Shape of Life website. Have students partner read the one paragraph summary, then answer the 6 questions on page 1. Warm up in journal: If Echinoderms do not have a brain, what do they have? What traits do animals share? Students write first ideas in journal. Have students write their second ideas to ” what traits do we share?” In journal. Challenge your students to make a better song! Core English and History department is working on reading complex text so we are too! Use the Encyclopedia.com “Echinodermata” article. Have a discussion with students about why having strategies to attack complex text is important and give examples of when in their academic lives and in their careers these skills will come in handy. Read a paragraph, have students follow along. Annotate when you feel necessary. Return to the original Sand Dollar and Sea Urchin Exploration graphic and add ‘next ideas” in pen. Take quizlets. * You could make your own quizlet, but we suggest some that were already made to save time. We also made a quiz review packet and handed out to students (coming soon). Give students the printouts of 5 Mass Extinctions and the sand dollar fossil record. View UC Berkeley’s Systematics: click on Echinodea. Read Fossil Record Echinodermata and the Natural History Museum Evolution reading and view 3D models. View the British Chalk Fossil site with students. Click on Echinodea to see fossil variation. Look for body structures we recognize in modern day echinoderms. Use notes to place sand dollars over time on geologic time scale in notebook. Post a large time scale in classroom, and have students help place sand dollars into correct time frames. Have students compare modern day sand dollar structure to changes over time. There is potential here to do a compare/contrast writing piece. Return to the Learning Goal question and ask students to write about how echinoderms have adapted over time to become one of the ultimate marine dwelling animals. 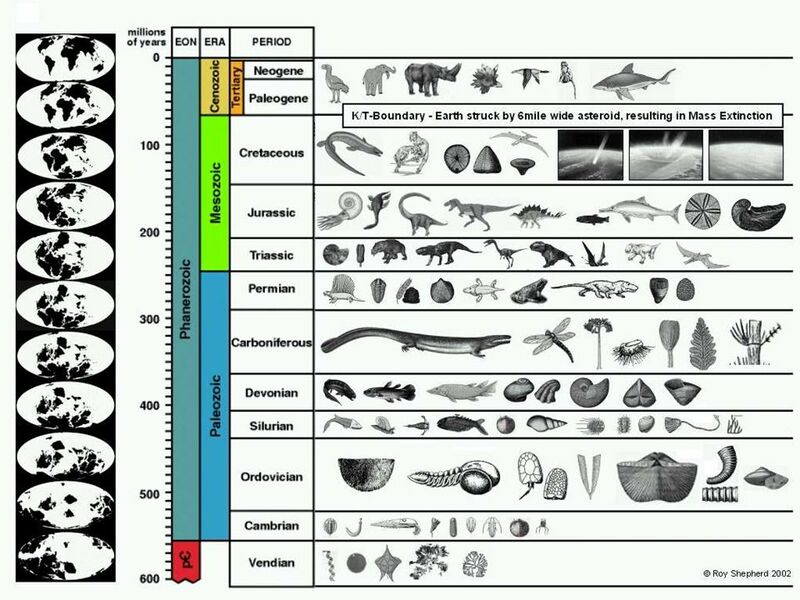 DAYS 13-16 Have potential for deeper inquiry into the fossil record and change over time. Perhaps an add on on how to classify animals and make cladograms. • Construct an argument with evidence, data, and/or a model. (4-LS1-1) Identify where in your lesson science practices appear. • Plants and animals have both internal and external structures that serve various functions in growth, survival, behavior, and reproduction. (4-LS1-1) Identify where in your lesson disciplinary core ideas appear. • A system can be described in terms of its components and their interactions. (4-LS1-1) Identify where in your lesson crosscutting concepts appear. • 6.RP.A.1 understand the concept of a ratio and use ratio language to describe a ratio relationship between two quantities. • 6.EE.B.6 use variables to represent numbers and write expressions when solving a real-world or mathematical problem; understand that a variable can represent an unknown number or, depending on the purpose at hand, any number in a specified set. • * this would fall more into Annie Harris’ lesson on the Golden Rule- 7.RP.A.2 recognize and represent proportional relationships between quantities. • WHST.6-8.9 Draw evidence from informational texts to support analysis, reflection, and research. • SL.8.5 Integrate multimedia and visual displays into presentations to clarify information, strengthen claims and evidence, and add interest. • SL. 8.1 Engage effectively in a range of collaborative discussions with diverse partners on topics, texts, issues, building on others’ ideas and expression their own clearly. All resources are embedded into each day within the procedure. Students should be familiar with and inquiry. Our lessons this year have been designed so that student questions drive the course. Student questions often guide me to new resources designed to p them discover answers without me telling them.Students have had multiple avenues to approach a new concept, to make observations then to ask first questions, followed by investigation, small group work to gather information. This process is followed up with second observation or next questions. We often go in a third time, and then complete the inquiry lesson with further questions that I can then weave into my next lessons or units.